Rotary Leg Extension With Rotary Disc In Glide Sheet. Designed to assist the lower limbs during functional transfers. This ingenious device consists of a rotary disc mounted beneath a padded cushion and a glide sheet. It enables a carer to effectively and safely assist lower limb movement during bed to chair transfers, minimising the risk to both carer and patient. 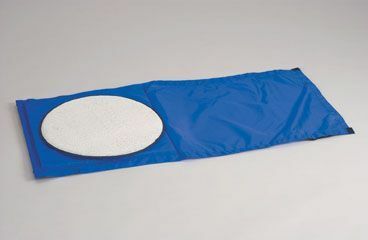 The glide sheet includes two sturdy handles to enable a sure grip. The padded cushion ensures patient comfort during the transfer. Ideal for positioning oedematous legs.